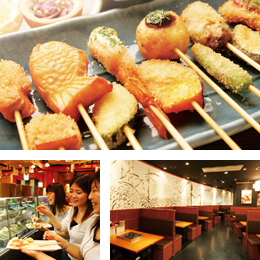 Twenty-five years have passed since the first Maido Ookini Shokudo opened in 1988. This brand has moved out into the world and as of the end 2013 the number of restaurants under the brand had reached about 440. The Shokudo brand's restaurants-having gone through a period of major expansion in the suburbs in order to satisfy the demands of this day and age-are being reborn in a new style. The brand has shifted from a traditional cafeteria approach where customers would select dishes on the varied menu from display counters to a style wherein always freshly made items are handed directly to the customer. Rice made by steaming in a pot using koshihikari grains milled on the premises, miso soup made by combining stringently selected miso bean paste with a natural Japanese-style soup stock, and freshly made tamago-yaki (roll-style omelet) using fresh eggs laid in from select farms are the Shokudo brand's premier dishes. Great store is set by preparing other dishes on the premises too, using carefully selected ingredients for such items as simmered mackerel and salt-grilled saury and presenting them straight from the heart. They are like local "something for everyone" restaurants found around town that can be patronized by people of all ages and all walks, from families with small children, to office workers and the elderly. 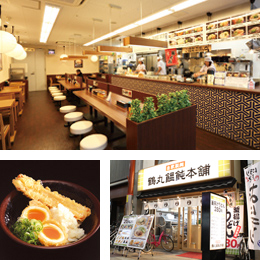 These restaurants have been getting singled out overwhelmingly by family customers in the restaurant zones of the large commercial facilities that have been opening one after another around Japan in recent years. They have incorporated into their all-you-can-eat approach not just the kushiage cuisine (batter-dipped deep-fried foods on skewers) that is part of Osaka's unique food culture, but also a bountiful side menu that includes Japanese-style curry, udon noodle dishes, salads, and desserts. These restaurants are a buffet-style take on kushiage cuisine, in which the customers pick from among 60 ingredients originating from both land and sea then batter and fry them themselves using fryers set at every table. They use six kinds of our own homemade sauces as well as healthy cooking oils we have developed in-house that contain linoleic acid and are very easy on the body; we likewise have our own exceeding standards when it comes to bread crumbs and flour. The Kappogi restaurants differ in style from conventional izakaya (Japanese restaurant-style pubs) by having a relaxing atmosphere that targets Japan's baby boom generation. They are situated mainly in locations set somewhat apart from the main thoroughfares of office districts. Restaurant staff are mainly women, all of a cheerful motherly sort. They are establishments awash in homey warmth. The menu features Japanese home cooking basics such as gyusuji tofu-ni (simmered beef shank and bean curd) and nikujaga (a stew-like beef and potato dish) made full of motherly love and served in large dishes lined up at the counter. They are all daily dishes just right for when someone wants to eat a "proper" meal and can also work well over drinks. Customers can have a drink with this cuisine in the evening, while at lunchtime the menu offers customizable meal courses that allows them to choose a soup and three side dishes, all at a reasonable price. 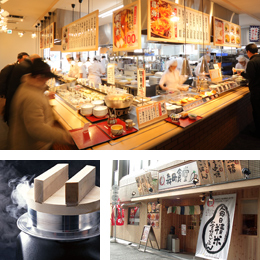 The Tsurumaru brand has accumulated 17 years of history as a pioneer in the self-service udon restaurant business since the first restaurant opened in 1996. Restaurants in the brand are found not just in office-district buildings, but have spread out to suburban locations as well. The restaurants's thin-style noodles, which go well with rice, are proving particularly popular with families. Our unique udon noodles have been developed by Fujio Food System in conjunction with a noodle making company; they are boiled in large pots at the restaurants, and are served up and consumed with a lightly flavored broth made using dried sardines and two other natural ingredients. Customers can choose their own toppings, including tempura dipped in wheat flour with carefully selected seasonal flavorings and deep fried in canola out of considerations for health. 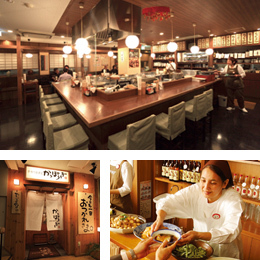 Restaurants operating under the Tsurumaru Udon Honpo ("Tsurumaru noodle-making" brand serve noodles that are always made on the premises.